Paraffin wax provides therapeutic and indulgent properties due to the deep penetrating heat which accompanies the application of this occlusive mask. This produces an intensely hydrating and nourishing effect on the skin and assists sluggish circulation; hard skin conditions and soothes painful joints. 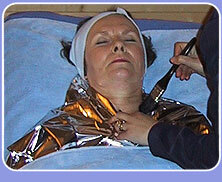 As such this treatment is particularly effective for stiff, tense muscles or joints, aches, pains and muscular fatigue. The addition of marine algae and essential oils can also be used as a detoxification treatment.